The president of the Italian Rugby Federation claims Treviso and Zebre will not be expelled from the Pro12. Alfredo Gavazzi says he has proposed a "mediation" plan to the Irish, Scottish and Welsh unions over 1.5m euros owed to the rest of the Pro12 clubs. "I 100% exclude any kind of expulsion as we're equal partners and there are contracts in place," he told the Il Mattino di Padova newspaper. London Welsh and London Scottish have had talks about replacing the Italians. However, Gavazzi says he is confident his plan can avert an expulsion. Scrum V: Will Italian sides Treviso and Zebre leave Pro12? "I met the other unions' CEOs on 28 April, and I presented them my mediation proposal," he added. "I think it's a good one. We will have an answer over the next few days." Treviso, Zebre and London Welsh have declined to comment. Discussions remain at a preliminary stage, though Scottish have said they are interested in a move from the English Championship. Chairman Sir David Reid said last year his club was "open-minded". Italian clubs were introduced to the Celtic competition in 2010, with Treviso and Aironi the first representatives. 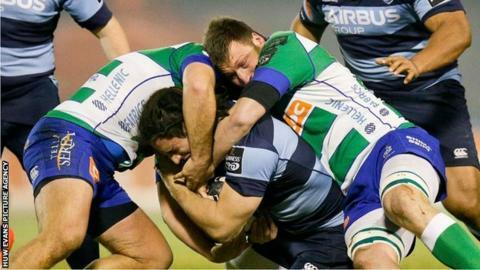 Zebre replaced Aironi for the 2012-13 season and both teams have finished bottom of the table in every campaign. Treviso have been more competitive, finishing the 2012-13 season in seventh place. They are 11th in this season's table, 12 points adrift of 10th-placed Cardiff Blues.